Memories from the author’s own childhood experiences—as well as those of his son, his friends, and the young men he worked with as a middle-school teacher—inform this too-slim book of poetry from the perspective of a 12-year-old Chicano border kid entering the seventh grade. Here, our super-smart protagonist and poet clearly knows who he is and what he comes from. And he’s learning what he’s been given to do. As a child of dual cultures who has learned to float between different groups, Güero uses variations of language to express himself. He communicates in Spanish and English with his elder relatives (especially with his bisabuela, who enjoys instructing him traditionally through dichos), mostly English with his teachers and friends (“los Bobbys”), Spanish first with new arrivals, and an effortless combination of English, Spanish, Espanglish and code-switching with everyone else, including family and readers. It’s especially refreshing that there is no italicization of anything: the languages and word-images blend with an authenticity rarely seen in middle-grade stories. And it’s appropriate that the glossary does not distinguish between language types, which readers will be able to infer from context. as you and you and you. about our gente, about the Revolución. instead of the violent land-grab it was! This should be México, m’ijo. The border? It crossed right over us. through Mexico bottom to top. sliced off his brother’s leg. They Call Me Güero is as far from cultural tourism as one can get. Rather, Bowles has taken to heart the advice of his Uncle Joe, who told him this: “Represent us, m’ijo, all the ones they kept down. You are us. We are you.” Indeed, his evocative story-poems are filled with family and culture and memories and sadness and humor and everyday experiences and playful language and hard history lessons, all told in the voice of a Tex-Mex almost-teen the author knows well. Middle-grade readers (especially, but not limited to, border kids) will easily relate to this young person, who easily relates to them. 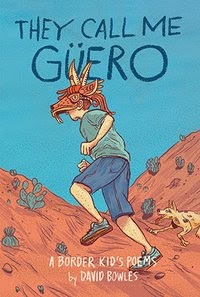 They Call Me Güero: A Border Kid’s Poems is highly, highly recommended.